U.S. Air Force Staff Sgt. Daniel Thompson, 76th Airlift Squadron C-37A executive flight attendant, receives recognition from Brig. Gen. Mark R. August, 86th Airlift Wing commander, at the 76th AS on Ramstein Air Base, Jan. 3. Thompson was recognized for his excellence in executing the Air Force’s mission across the European theater of operation. A 76th Airlift Squadron executive flight attendant received the honor of being Ramstein’s Airlifter of the Week, Jan. 3. The 86th Airlift Wing commander and command chief lauded Staff Sgt. Daniel Thompson, for his excellence in executing the Air Force’s mission across the European theater of operation. 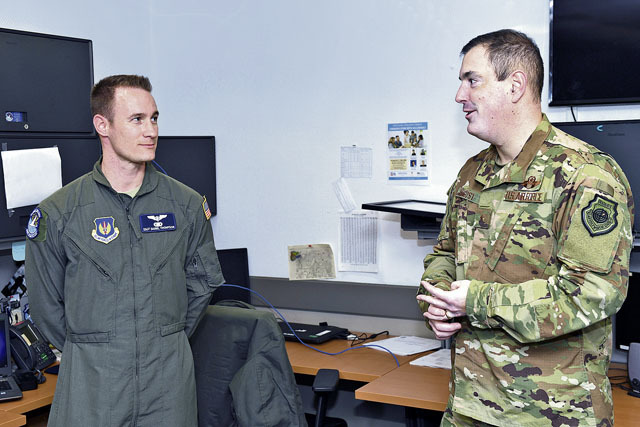 Thompson, originally from Arlington, Texas, implemented a new tracking process for the squadron training office which mitigated scheduling shortfalls. His efforts validated 139 ground training events and enabled 226.8 aircraft flying hours, 95 sorties, and nine distinguished visitor missions. Furthermore, Thompson put his culinary skills to the test by preparing a meal for the King and Queen of Belgium. “The enlisted aides reached out to the flight attendants and asked for help because they were preparing a six-course meal for the King and Queen,” said Thompson. The Supreme Allied Commander Europe met with the King and Queen for dinner. To give them a taste of the United States, Thompson and his culinary partners created a variety of dishes popular in different states. Thompson said he felt honored to be recognized for his hard work.